Thanks to my hectic schedule, I’m always leaving present-shopping till too late! Well, I checked out vPOST‘s Valentine’s Day promotion and am reminded that there are only four days left till Valentine’s Day. Actually, the Goonfather doesn’t expect Valentine’s Day presents from me, but I like buying him stuff. The problem is, there always isn’t time. I had left Christmas shopping till too late last year and ended up buying a tin of cookies for him on Christmas Day itself. So, I’ve decided to shop online this time (and all future times – birthday, anniversary, mother’s day, father’s day, teacher’s day, children’s day… um, everything lah) because I doubt I’ll ever have time to go hunting all over Singapore for presents. Shopping online is a good idea. I found a few things I could get for the Goonfather which I would never have found if I’d randomly gone to some generic shopping mall. The first one is a Mazda RX-7. Well, okay, it’s a remote control car but it drifts! The Goonfather loves remote control cars. And drifting. But his remote control cars can’t drift and it’s too expensive to drift his real car, so he only does it in video games. Now there’s this! Check out the video. It’s very amazing!! There are six models to choose from. 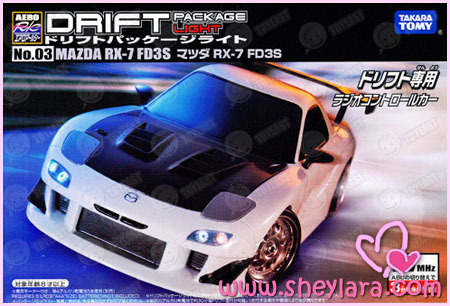 I chose the RX-7 because that’s my favourite car in Initial D (the anime). Next item. A missile launcher. It’s so geeky I think all guys will love it. I love the product description. The office arms race continues, and we think this newest escalation could very well lead to mutually assured destruction on all sides! With the ability to connect (and simultaneously control) an almost unlimited number of missile launchers (well, only limited by your system memory and number of USB ports), the USB Laser Guided Missile Launcher will empower you to unleash something akin to total office annihilation. Not only will you achieve strength with the size of your battery of missiles, they will be accurate too. 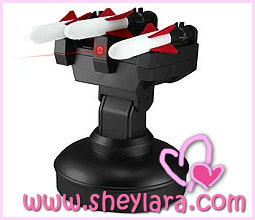 The built-in laser missile aiming system will allow you to aim and fire your weapons with close to pinpoint accuracy! Just point the red laser dot at your target and slowly squeeze your mouse trigger finger. I can imagine the Goonfather terrorising all his colleagues with this. ThinkGeek has tons of cool items you can buy your guy (or for geeky girls… like me)! There’s also this item he’s been eyeing for a long time. 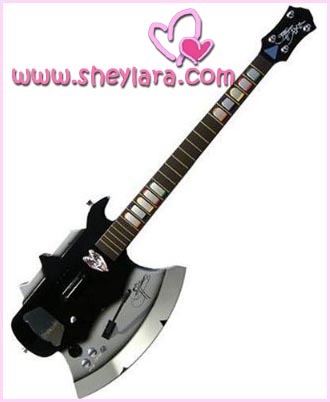 The Gene Simmons Axe Guitar (compatible with Rock Band and Guitar Hero games). Is that the coolest guitar ever or what? Well, I can’t really decide. Maybe I’ll get everything cos they’re all so cool. Of course, I’m using vPOST for my online shopping cos there’s a Valentine’s Day promotion offering 20% off shipping charges till Feb 28, 2009! Yay! What I like about vPOST is that it allows you to buy items from USA, UK and Japanese websites (over 350,000 of them) even if those sites do not ship to Singapore. That’s really handy, I think. You will get USA, UK and Japanese shipping addresses to use for your order so that vPOST can receive the items on your behalf and ship it to Singapore within five to eight working days (upon payment of shipping charges). I suppose that doesn’t tell you very much. Haha. But you can read the fully detailed guide here. 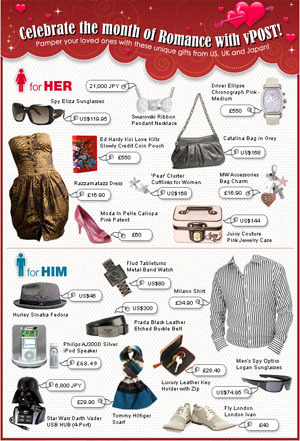 vPOST also provides a vCONCIERGE service which helps you buy stuff. It’s great for people who don’t have credit cards, or for times when a retailer doesn’t accept your Singapore-issued credit card. Well, thank goodness for online shopping. Then again, one of the hazards is that you will find so much great stuff without much effort that you’ll start inventing reasons to buy presents for people. One of my favourite sites to shop at is JBOX, which has all sorts of crazy Japanese things. For example, how about this ninja sword ear cleaner? LOL. The Japanese come up with the craziest stuff. Speaking of which, if you didn’t watch I Survived a Japanese Game Show, you MUST watch it because the Japanese thought up the most hilarious ways to abuse a bunch of Americans and it’s so entertaining! YouTube has the entire season. 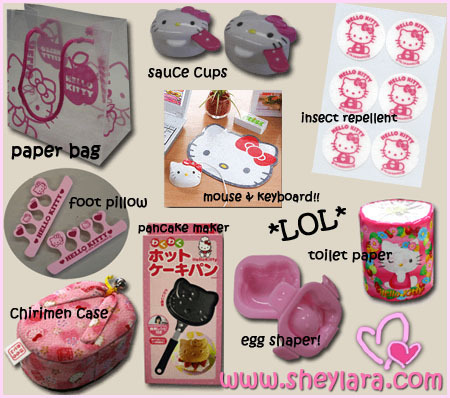 JBOX also has lots of irresistable Hello Kitty merchandise which will cute you to death. ← Are Singapore men romantic? Sheylara >> Dude, you stayed up all night to write this article.. and itz an awesome article. You rawks !!! I love the Gene Simmons guitar.. freakin awesome.. i juz wanna hang it on my bed room wall.. !!! V-Post? i hope itz better than DHL ( Delivery Halfway Lost ) ..
hey, this Valentines Day .. most reservations will be cancel.. due to Friday the 13th.. most of their dates ends up in hospitals or mortuary.. I drive Kerrendor crazy with my packages sometimes. The MAD ICBM launchers wouldn’t help him with his career much… y’know. Thanks for the vpost tip Sheylara! I’ve been wanting to get something from thinkgeek for the longest time! ThinkGeek rules! Oh, and Gene Simmons is a member of the legendary hard rock (some say heavy metal) band KISS. They’re the ones who uses signature corpse paint, costumes and excessive pyros when performing. If you look closely at the guitar, he is the face printed on it. Hehehe. Oh, he has a long tongue too in case you wanna know. 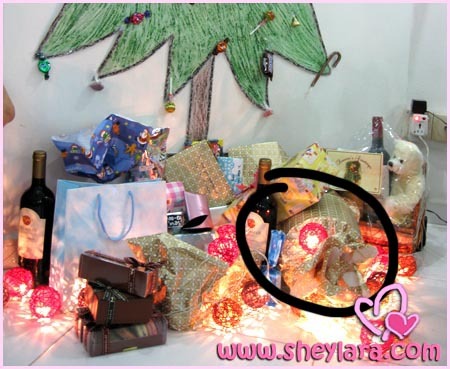 Too bad for me lar… My gf had birthday last year december and I bought her a expensive present. 2 months later, it’s Valentine’s Day and my budget couldn’t recover yet. Perhaps, I should tell her no present this year Valentines. Darz: Thanks, man! :) And your joke… that’s sick but funny. Haha. 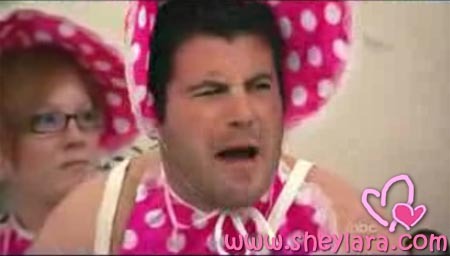 What, you like the Hello Kitty? zhuzhu8376: You seemed experienced. Used all the services before? Peaches Mode: Yeah, I never noticed the face on the guitar until you mentioned it. Coolness! Erm… long tongue, huh? Is it forked by any chance? lol.